Honeywell expands its family of best-selling handheld laser scanners with their Voyager 1200g, which is an especially high-performance barcode reader. The scanner boasts high-tech components contained within the familiar futuristic housing, which has also been optimised: the single-line laser scans barcodes most accurately and even poorly printed, damaged or smudged codes are read easily. Being highly versatile, the device suits any application. Whether at the checkout, in the warehouse, the workshop or the laboratory – it always makes a good impression. The Voyager 1200g is a truly universal solution: it not only scans all 1D and GS1 DataBar codes, it aggressive engine also reads the smallest codes up to 3.5 mil. Thus exceptionally flexible, the Voyager 1200g makes other scanners redundant. Furthermore, it includes a multi-interface for USB, KBW and RS232 connection that is automatically identified – a single device which is thus compatible with almost any system. 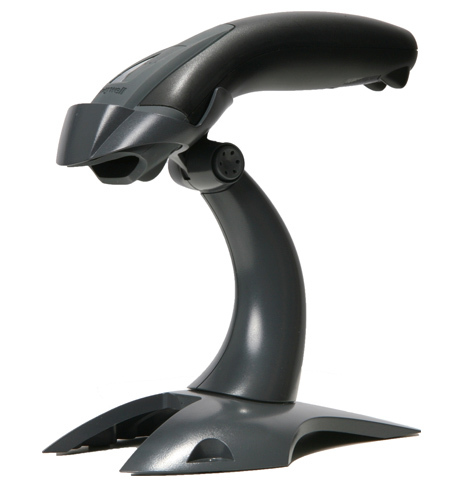 Using the optional scan stand, you turn the handheld scanner into a desktop scanner for the table or counter in no time. The scanner detects when it is placed in the stand and switches to »Presentation Mode« automatically. Thanks to its object recognition sensor, users simply pass the goods in front the scanner and achieve high throughput. The Honeywell Voyager 1200g naturally features the popular CodeGate technology, which makes working with lists an easy task. While CodeGate is active, the scanner reads all codes automatically but does not transfer them; before transmitting the data, the user must confirm the code by pressing the CodeGate button. Whenever it is pertinent that the correct barcode is used, this function is most useful.